R. To pilgrims lend your aid. For with divine strength, prophecy began in God’s first work—Adam—throughout the time when the old law appeared with its harshness and then came to an end with the advent of the ardor of justice and truth. Prophecy has thus shown from generation to generation through the various ages of humankind, like a light in the darkness (John 1:5), and it will not rest from its sound until the world’s ending, offering words of multivalent signification because it is imbued with diverse mysteries by the Holy Spirit’s inspiration. For prophecy exists in humankind like the soul in the body, because as the soul is hidden within the body and the body is governed by it, so prophecy that comes from the spirit of God, who excels all creation, is invisible, and by it every failure is reproached and all who leave the path of righteousness are led back. The prophets indeed had said that the woman who was to give birth ought to come forth from the act of charity, like the branch from the root of Jesse (Isaiah 11:1)—and they all ascribed this virginal birth to the King, the Son of God. For when this woman enclosed the Son of God and humans saw and heard him in the likeness of their own image, they loved him more than if they had not seen him—for what humans see in shadow they cannot know in fullness. So too when the prophets spoke in the sound of shadow, they often passed through as if in shadow those things that nevertheless were all afterwards rendered in solid form among humans, because prophecy’s sound proceeds from the hidden mysteries of divinity. The apostolic teaching shone around the head of the Church when the apostles first began to build her up by their preaching; moving through different places, they collected workers who would strengthen her in the Catholic faith and make themselves into priests and bishops and all the ecclesiastical orders (…). Therefore, the chrism-makers [pigmentarii] conform to that teaching (…). What does this mean? That [the apostles’] followers, who took their places, faithfully traverse streets and farms and cities and other places, regions and lands, carrying the health-giving chrisms [saluberrima pigmenta] and announcing the divine law to the people. (…) For they have this office that they may openly serve the bread of life to the people. This description of the Church’s ministers as pigmentarii comes at the opening of the very same vision in Scivias that later centers on the order of virgins to which Hildegard and her nuns belonged, gleaming and beaming at the heart of Mother Church, singing the new song of the heavenly Jerusalem that John the Divine described in Revelation 14 (as discussed in the Commentary on O speculum columbe). St. John’s sweet rain nourished the Promised Land of the Church to spring forth the choicest blooms, redolent with salvific fragrance, shining like gemstones in the golden City’s walls (cf. Revelation 21) to declare the True Light (cf. John 1:8-9), and resounding with the Word’s purest voice. This work is primarily organized by the final, E. The transcription phrasing follows the musical structure. The Verse departs somewhat from the grammatical punctuation by the final and employs the C below and the G above as tonal markers. In those cases where phrases are too long to be fit on a single line, they are continued, and a tick barline has been placed at the conclusion. In some cases, singers might opt to phrase differently while keeping essentially within the outline by E. For example, the salutation, O dulcis electe, is quite long, and one might elect to separate out each of the words or to group as: O / dulcis electe. The repetendum is indicated at the end of the piece by the repetition of Prebe, as per the manuscript sources. 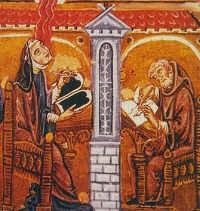 Hildegard of Bingen, Symphonia, ed. Barbara Newman (Cornell Univ. Press, 1988 / 1998), pp. 168 and 287-8.